25/11/07 — Acquisitions — Madrid, Palacio Real and Museo del Prado — In his book on Anton Raphael Mengs in 1780, the historian and politician José Nicolás de Azara tells us that of the nine paintings decorating Charles III’s “bedroom” at the Royal Palace, the king preferred the Immaculate Conception by the German artist, and took it with him on most of his trips . Removed at the time of Joseph Bonaparte, the canvas was never recovered after the end of the War of Independence and all trace of it had been lost. After surfacing again in an English private collection, Spain’s Patrimonio Nacional purchased it at Sotheby’s for 412,640 € (ill. 1). With its medium size, its half-body representation recalling the Classicist style and the Bolognese tradition of Guido Reni, the work constituted an obvious antithesis to the Rococo, and especially to the contemporary interpretation of the same subject by Giambattista Tiepolo (Museo del Prado, around 1767). The Royal Palace is practically a small Mengs museum all on its own with its ceilings in the reception galleries and the portraits hanging there as well as with the series of Christ’s Passion and several studies held in the royal collections. The acquisition budget is of 500,000 € a year used for purchasing works related to the Spanish Crown. 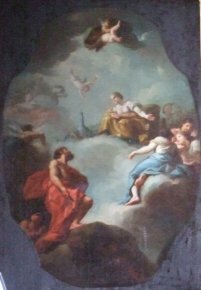 Among the most recent acquisitions, there is a fragment of a tapestry belonging to Queen Isabella, other tapestries from Charles III’s bed, as well as a bozetto by Mariano Salvador Maella for the ceiling in the anteroom of Queen Maria Luisa (1769, present Billiards Room), representing Juno Asking Aeolus for the Winds to Blow against Aeneas (ill. 2) . A museum for the royal collections is under way in the south-east wing of the palace on five floors designed by the architectural firm Tunon-Mansilla. It should open in 2012. The Royal Palace also organizes exhibitions, such as the one currently devoted to Greek Taste in the XVIIIth C. and its Origins in France . 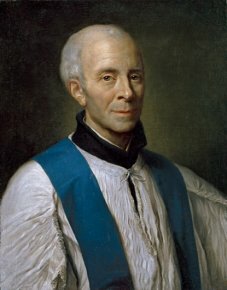 This News item also provides us with the chance to remind readers of the recent entry of a very moving painting by Mengs into the Madrid collections, the Portrait of the Abbot Joaquín de Eleta (ill. 3), purchased by the Prado in 2005. It reveals a rare aspect of the artist, who shows here a subtle psychological attention, a tenderness towards the model and an unexpected sobriety of means that are in a totally different spirit from the majestic portraits already in the museum. Don José Nicolás de Azara, Obras de Antonio Rafael Mengs primer pintor de cámara del rey, Madrid, Imprenta Real de la Gazeta, 1780. 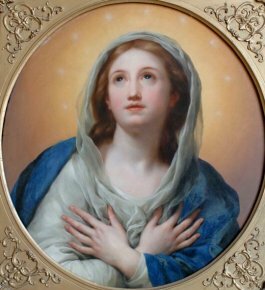 Azara knew the painting well because he owned a similar version which entered the Musée du Louvre thanks to the Lemme Donation in 1997 and which differs in its more pale colors, the cloak being white instead of blue. This painting came up for auction at Christie’s London, 5 July 1995, lot 317, ascribed to Alexandre Ubelesqui (1649-1718), suggested by Antoine Schapper who had been consulted, once again proving the enduring influence of the Versailles aesthetic taste in great Baroque palatial décors... The ceiling is currently hidden by a decoration from a later period. Maella’s preliminary study was acquired in 2007 by the Musée du Louvre. The exhibition was organized in conjunction with the Musée du Louvre, from 24 October 2007 to January 2008. Several events will be celebrated in 2008 around the War of Independence and the revolt against France. The main source for this article is the press conference held on 9 October by the president of the Patrimonio Nacional, Yago Pico de Coaña.